Charmain joined StreetSquash in 2018. She earned her bachelor’s degree from the University of New Hampshire and her Master’s Degree from Stony Brook University in Higher Education Administration. 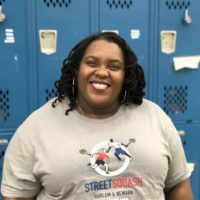 Before coming to StreetSquash, Charmain worked at Project Reach Youth as the Coordinator of College Programs and Initiatives, and founded her own education consulting firm, BK College Works.